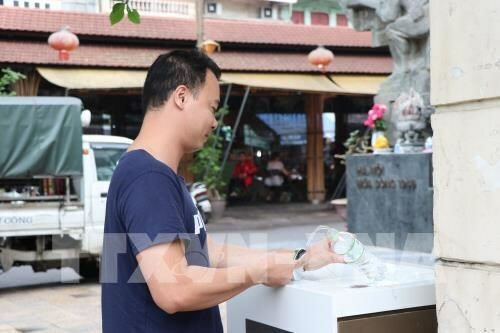 Hanoi (VNA) – In an effort towards a civilized, modern and smart city, Hanoi has installed free drinking water taps in some streets, which has received the enthusiastic responses from tourists and local residents. The taps were put in Dong Xuan and Hang Da markets, and Son Tay garden in Hoan Kiem district in January by Water Manufacturing JSC No. 3. According to Nguyen Dinh Tien, Director of Water Manufacturing JSC No. 3, with cutting-edge equipment, the three taps meet standards of bottled water and requirements set by the Health Ministry. The installation aims to serve the public, especially those in difficult circumstances who have no clean water for daily use, while contributing to promoting the image of Hanoi as a peaceful, civilised and modern city to foreign visitors, he said. Luong Phu Thiep, a taxi driver at Dong Xuan market, said the drinking water taps are very useful and convenient for him as he spends a lot of time driving. “The taps help me save about 30,000-40,000 VND (1.29-1.72 USD) a day on drinking water,” he said. Nguyen Thanh Cuc, a porter at Dong Xuan market, said she used to bring water from home to drink.